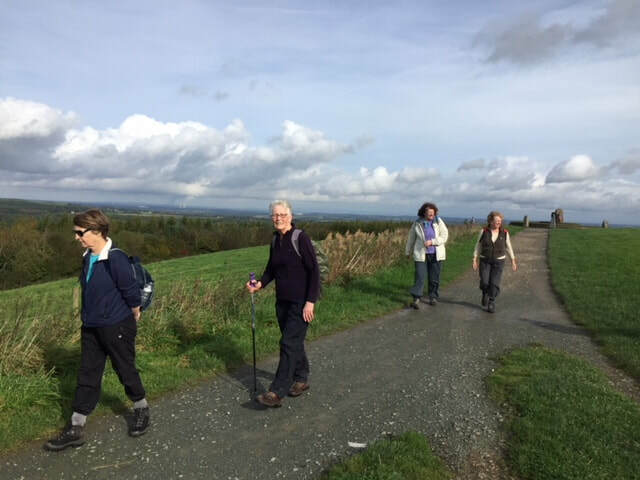 The weather was so much better today than last Tuesday, and Margaret led us on a walk from the Yeld carpark , along the old Roman road , and up to the Eddisbury Fort, from where we could take in the fantastic view. Once down from the fort , we had a choice....a shorter walk back to the carpark past the standing stones, or a longer one, finishing with coffee at the visitor centre. Unsurprisingly, we unanimously chose the latter option , as there was plenty of time, and the thought of an outside coffee was very appealing. Following a lovely, but very muddy, walk, we enjoyed yet another post- walk coffee. I'm afraid that the local coffee venues are never going to make a lot of money out of us walkers, because , despite some very mouth-watering cakes, we all rise above temptation....most of the time ! 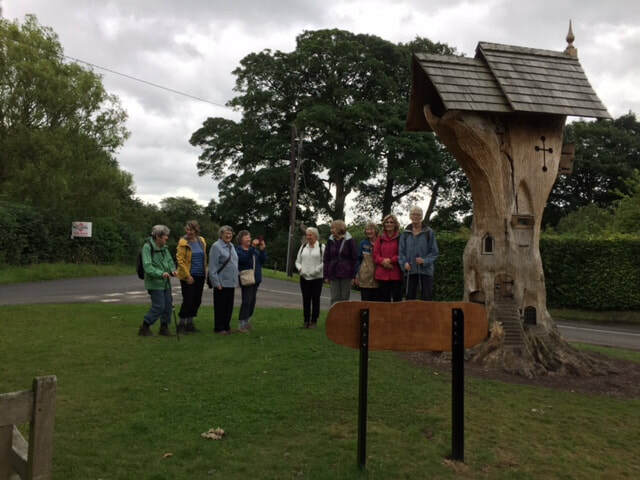 Today, Jean's mystery walk was unveiled as a walk around Little Budworth, which could be varied in length, according to the weather. 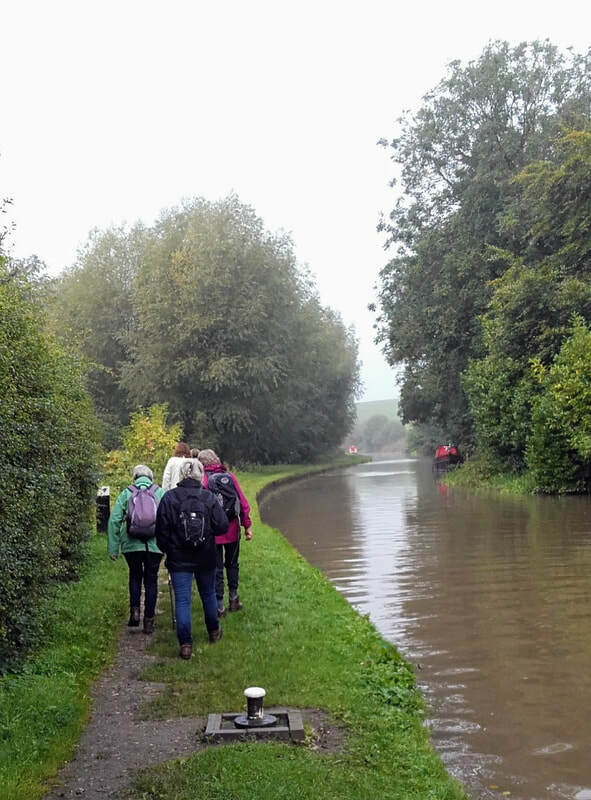 This morning, a few of our number would have preferred the walk to be no length at all ; it was raining quite heavily when met , but after some discussion, it was decided that we would attempt a relatively short walk, followed by coffee at a place still to be decided. 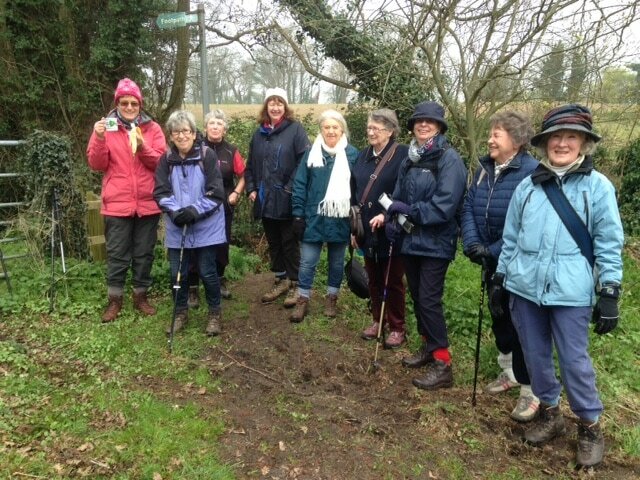 We set off from the Little Budworth carpark, accompanied by slight muttering about the rain, but there followed a very enjoyable,sociable, rather damp and muddy walk around the lanes, and we were all very pleased that we had done it. We felt that we deserved a coffee, so we drove the short distance to Wyevale Garden Centre, where we had a very enjoyable coffee,,,and no cake! 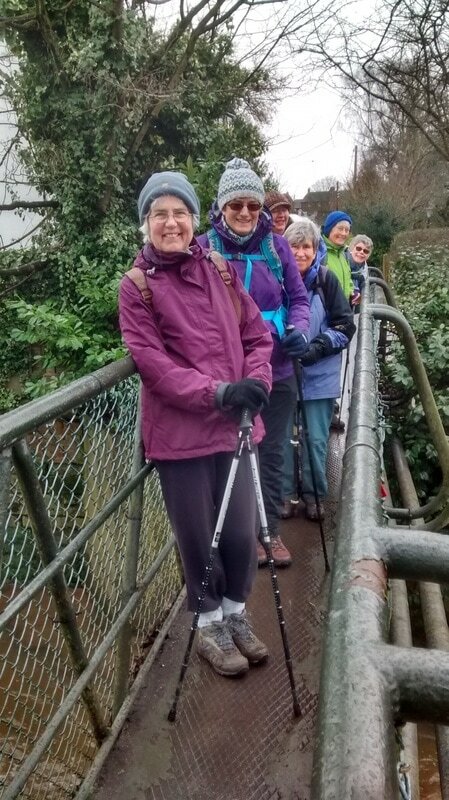 Joan was our leader today, and she led us on a very interesting and diverse walk around Chester, including areas where some of us had never been before . Bearing in mind that this was at the beginning of the half term week for the Chester area, and other parts of the country, and the centre of town would have been very busy, many parts of our walk were very quiet with hardly anyone around. Also, University of Chester graduation ceremonies were taking place , making some parts of the centre busier than ever! 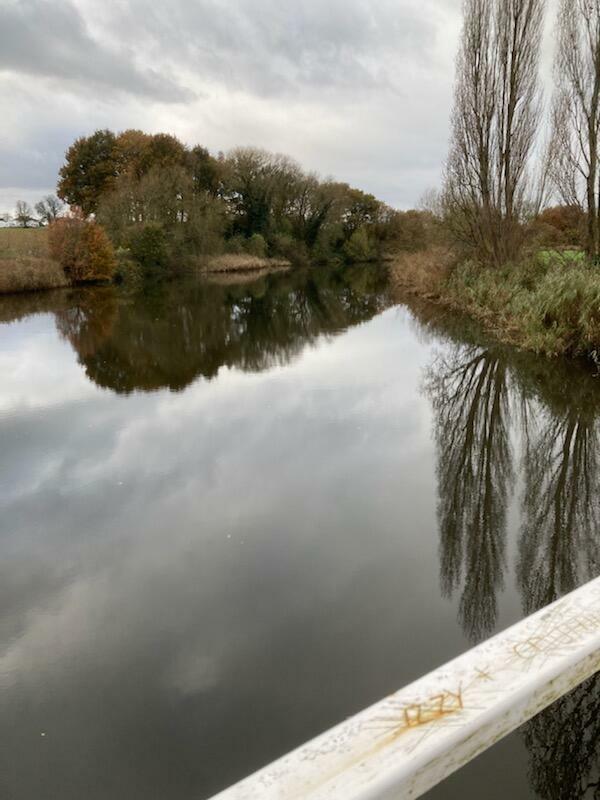 As usual for a Chester walk, we parked the cars at the end of the 'Aldi car park" and walked into town along the canal past Waitrose, and continued along the Canal, through the cutting, eventually arriving at the Dee, walking along an area called the Promenade. We walked along the back of the racecourse, and then halfway round the racecourse , where the accompanying picture was taken. We continued past the old Cheshire County Council building, now part of the University, across the Grosvenor Bridge and along the Riverside, (where it was busy), into Grosvenor Park. From there, we crossed over the road at The Bars, through a 'cut through', to rejoin the canal path and and walk back to our cars. it had been an extremely enjoyable and interesting walk, many parts completely new to me and others. As always on our walks, we were putting the world "to rights", consequently, this account of it may lack some accuracy! (Because there were parts of the walk new to us, I have attempted to include a more detailed description). One thing is certain, though, from our observations........we are indeed becoming a nation of flat-dwellers; there is a lot of building going on in Chester. Today, Myra led a walk through the forest, rather than her planned walk, due to adverse weather conditions. The walk ended with a very welcome coffee stop at the forest cafe. 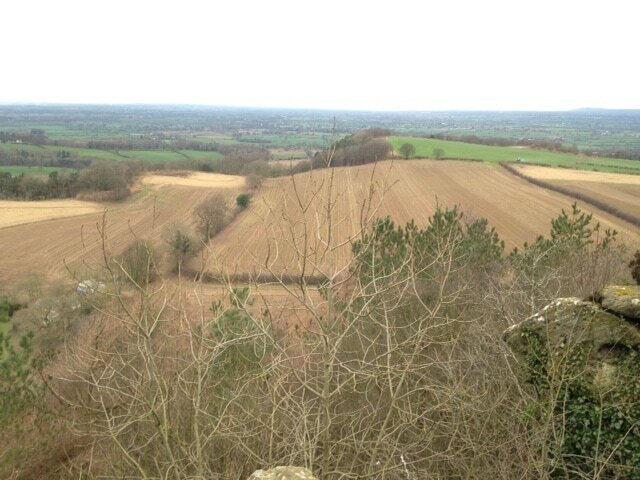 The following pictures were taken on Evelyn's walk around Helsby. 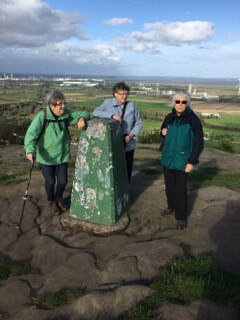 The walkers are at the triangulation point overlooking Stanlow Refinery, and later enjoying a picnic snack in the sunshine. Margaret's walk today began in Marbury Park where we initially walked alongside the mere which looked beautiful in the autumn sunshine. After walking through the woods we joined the Trent and Mersey Canal and followed it on to the Anderton Boat Lift. It was here that we had to make a decision - to stop for a break and drink our water or pop into the cafe for a delicious coffee. The cafe won! ....... and the delicious cake was resisted! 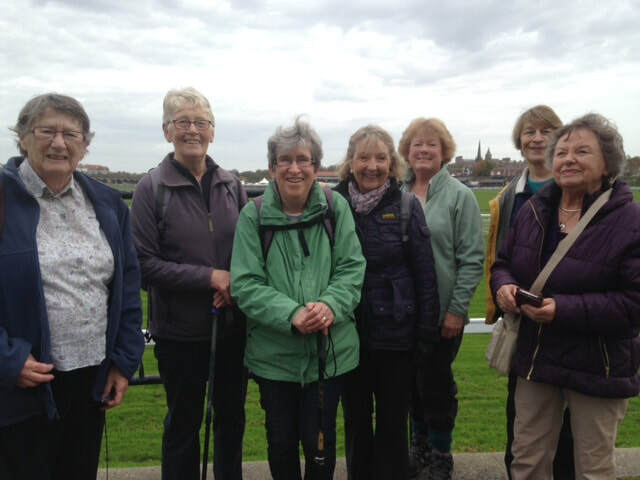 Today, we enjoyed a lovely varied walk around Bunbury, led by Sue. There were seven of us today, a small select group(! ), including a new addition to the group, Fiona. We met Jean by the church at Bunbury, and set off purposefully, following our leader. 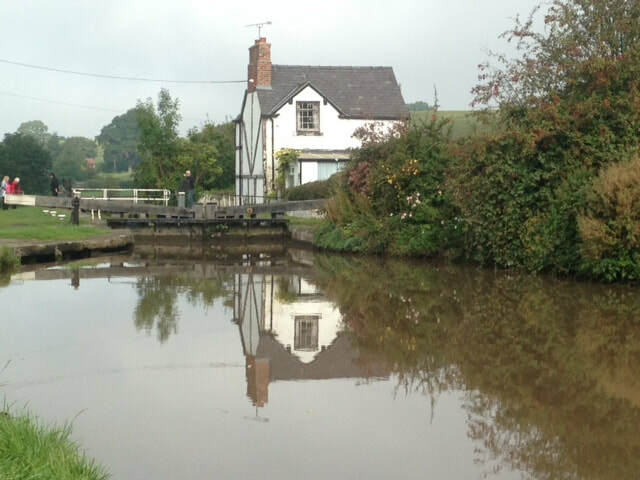 The walk took us over fields, through woods and along a stretch of the Shropshire Union Canal. We had quite a few challenging stiles to traverse, but the first aid kit, which accompanies us everywhere, was not required....is it ever? narrow boats on the canal , causing quite a queue at some of the locks. We stopped for our snack break at a picnic table 'canal side', and watched the activity as the boats prepared to go through the lock. As usual, it was the ladies manning the lock gates ! As always, we thoroughly enjoyed the walk, which was about four miles in length. 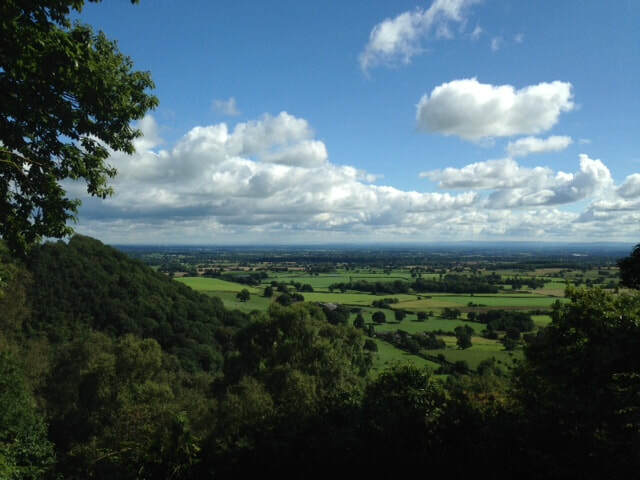 It is always a pleasure to be out and about in the lovely Cheshire countryside, enjoying the company of friends and putting the world to rights! 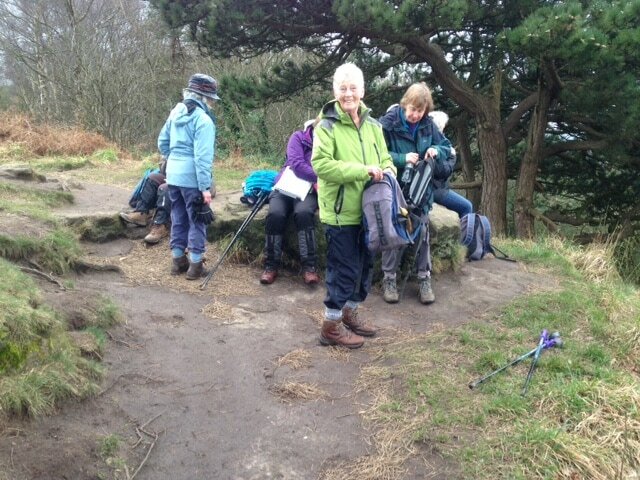 Today's walk, led by Anne , was around Burwardsley ....a walk which is well known to us , but no less enjoyable for that . Starting off from the Candle Factory car park , we walked for about four miles in total, taking off jackets as we progressed as the weather became warmer. Bulkeley Wood was particularly attractive today in the dappled sunlight, and the view from the rock which we all know so well was absolutely spectacular .......the English countryside at its very best, under the most magnificent sky! We encountered only one field of cows, which were extremely docile, much more so than the very lively and inquisitive animals that we met on the 18th July. On return to to car park , we were met by three ladies with clip boards , and we spent five to ten minutes responding to a questionnaire from the Sandstone Ridge Trust. Needless to say, we were all very positive in our responses. A great walk , marred only slightly at the very end by an episode of 'carpark rage'. Someone had obviously had a stressful morning! 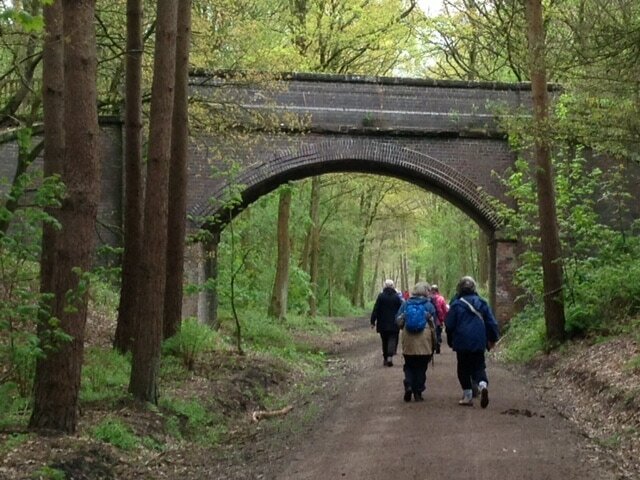 Today's walk was led by Vicky, around Peover. 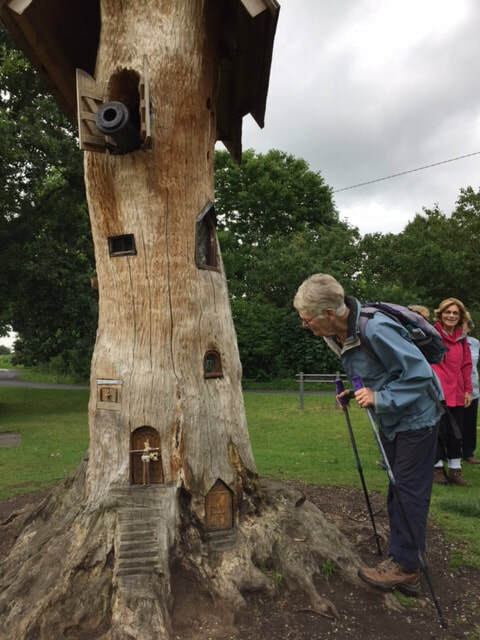 and the following pictures, taken by Cathy, show what a lovely walk it was, despite the rain, a particular feature being the Tree of Imagination, which is really amazing! Note the presence of Marie, who never walks in the rain ....it's a good thing that she had an umbrella. 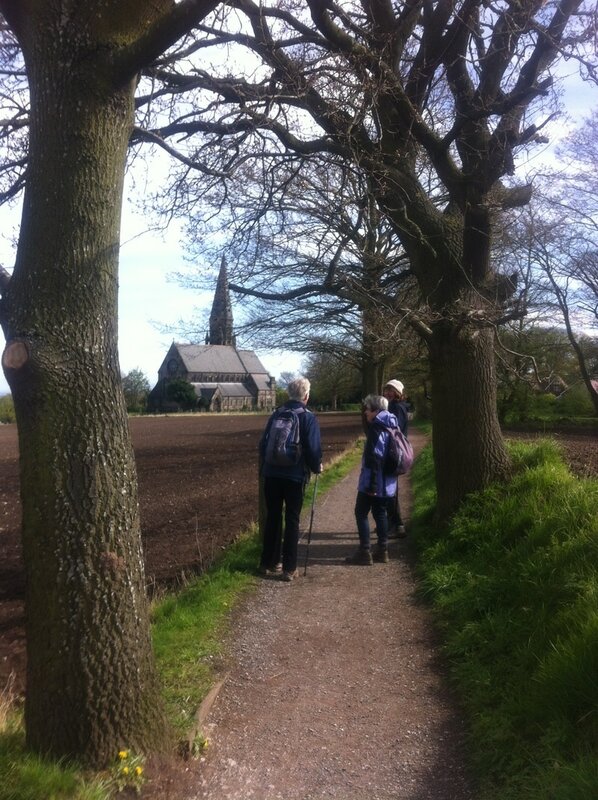 Today's walk, led by Sue , was around the very attractive village of Barrow, and was about 4 miles in length. 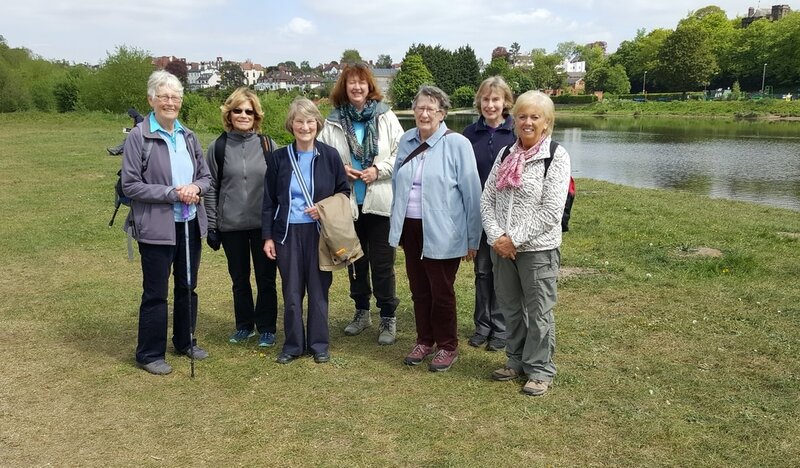 There were quite a few of us today, and we all thoroughly enjoyed the walk, which was very varied, walking over fields , along country lanes and through dappled , shaded woodland . As always , there was a great amount of conversation as we all caught up with each other's news. Sue had warned us at the beginning of the walk that we would have to walk through a field of cows, and that they were very frisky! 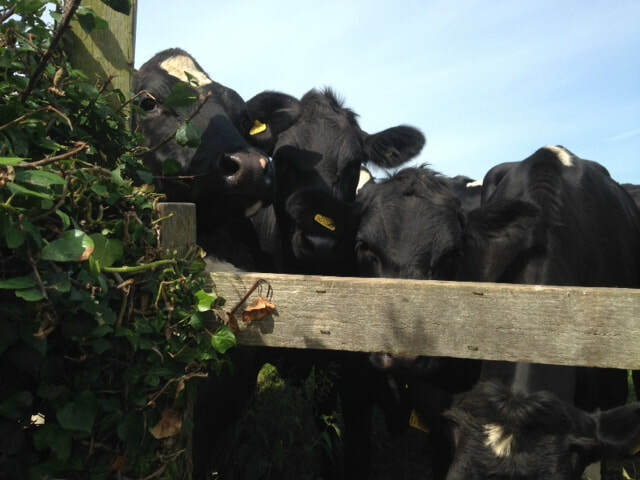 When we arrive at that particular field, towards the end of the walk, we discovered that they were indeed very frisky....the word 'inquisitive' was used to placate those of us with 'cow phobia'. They bunched around the group of walkers, and remained with us as we walked through he field, until we reached the safety of the stile. They would have climbed the stile with us if they could! 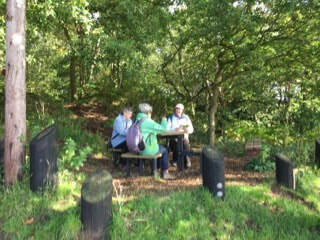 We ended our lovely walk by stopping for coffee at the Bluebell Cafe in the Barrowmore Estate. We sat outside under the shade of some beautiful specimen trees, enjoying ourselves so much that Sue had to remind us that we were not there for the day. A close encounter....just made it over the stile! A lovely place for a welcome drink. What a difference a week can make ! Last week's walk in beautiful sunshine and warmth...this week's in rain and about 12 degrees cooler! 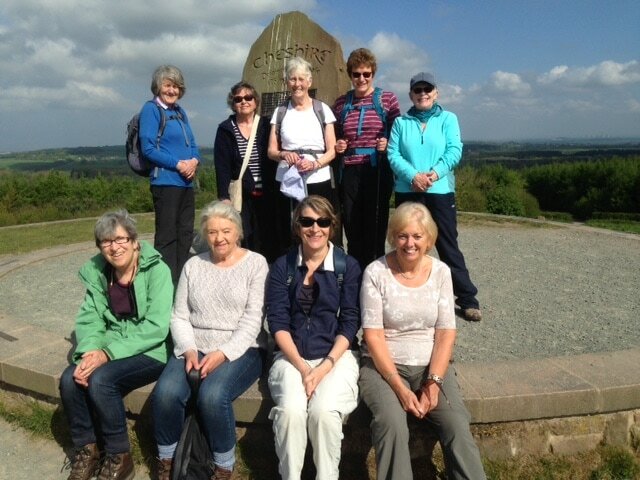 Today's walk was led by Anne, around Haughton Moss and Bunbury. It was a varied walk,through open fields, through trees and across streams and quite a few stiles, mostly in the rain, but occasionally we could put our hoods down, and enjoy a little bit of sun. En route, we stopped off at the lovely Bunbury church, but we were very reluctant to venture beyond the vestibule as the carpets were being vacuumed and our wet boots would not have been welcome. However , the church did benefit from the purchase of several hand-made greeting cards which were on sale just inside the door. 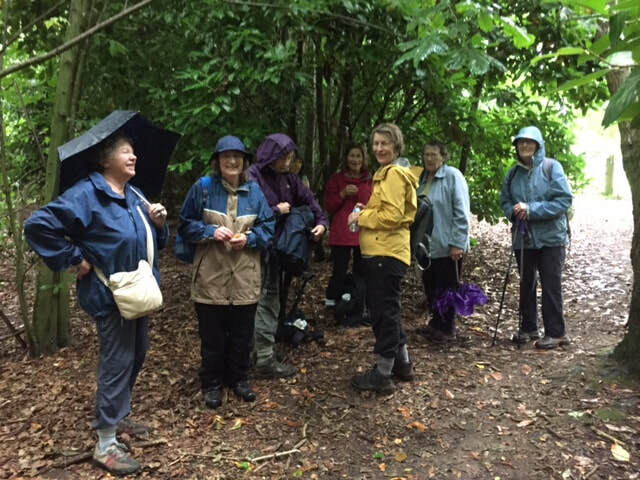 ​ Despite the rain and some initial doubts about the walk, our small select group enjoyed it and we all felt the better for it . 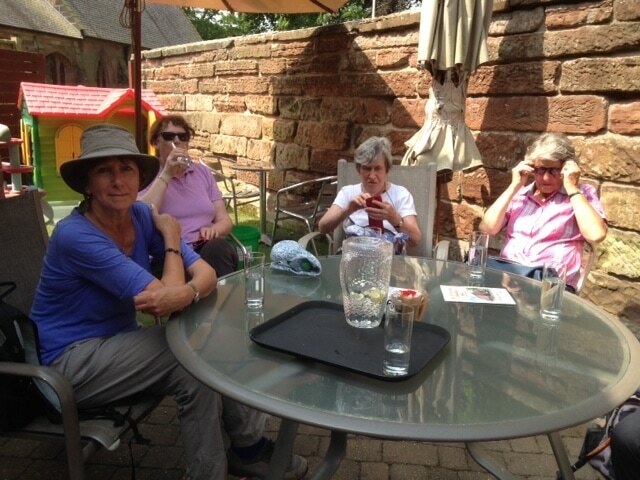 Today\s walk was led by Evelyn, around and about Tarporley, for just short of four miles. The weather was very hot, but thankfully not quite as hot as the previous few days .In spite of that , however, Evelyn informed us that she had dispensed with her vest! A very significant event! There were six of us today, and we had a lovely walk along the lanes around Tarporley, walking through and around Portal Golf Course, perhaps at times annoying the golfers teeing off with our chatter. Thankfully, no-one shouted at us! 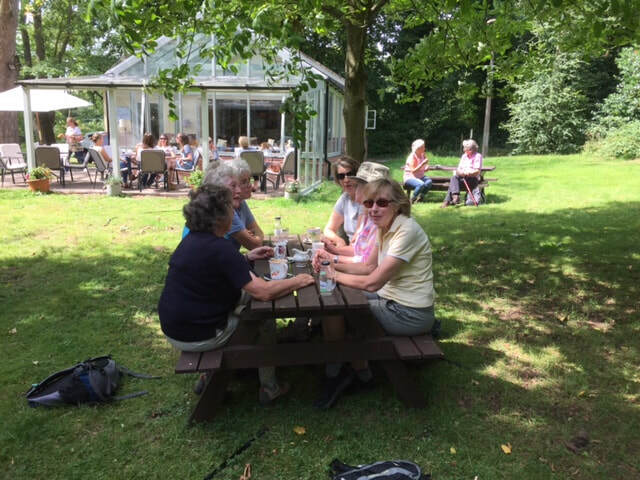 Returning to Tarporley centre, we enjoyed a refreshing drink on the patio behind the Old Fire Station Chocolate Shop, as the following pictures show, though most of us are in welcome shadow! 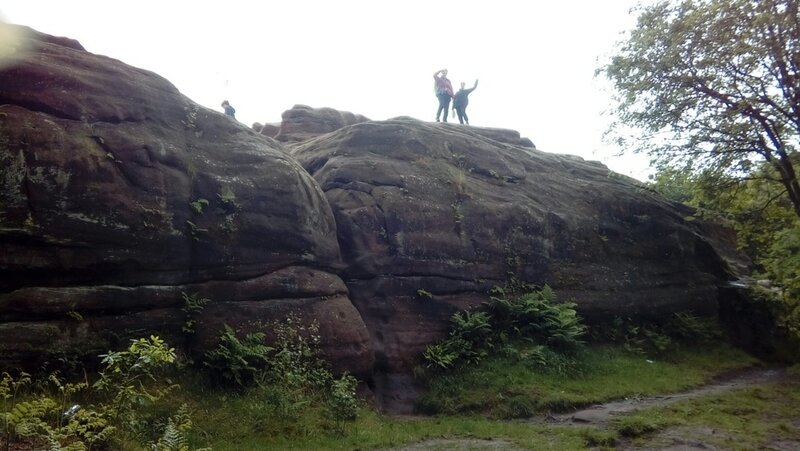 The following picture was taken during Heather's walk in the Thurstaston area​. Can you tell who our two intrepid members are? They are Pat and Cathy, who had climbed to the top of Thor's Stone. I am told that the other walkers were too sensible to follow them! They must have got down safely as no incident was reported, and all the walkers returned home , once again having had a thoroughly enjoyable morning. 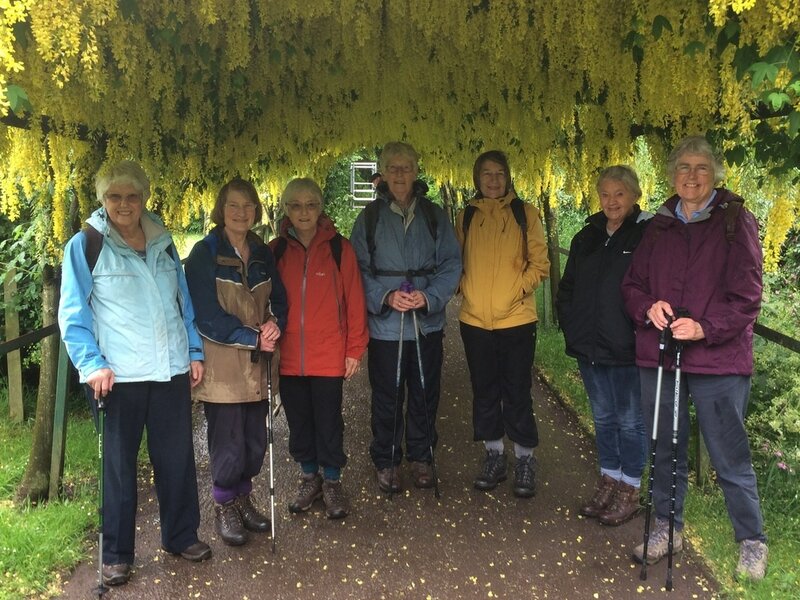 (The second photo, taken by Pat, shows the group under the Laburnum arch at Royston park). 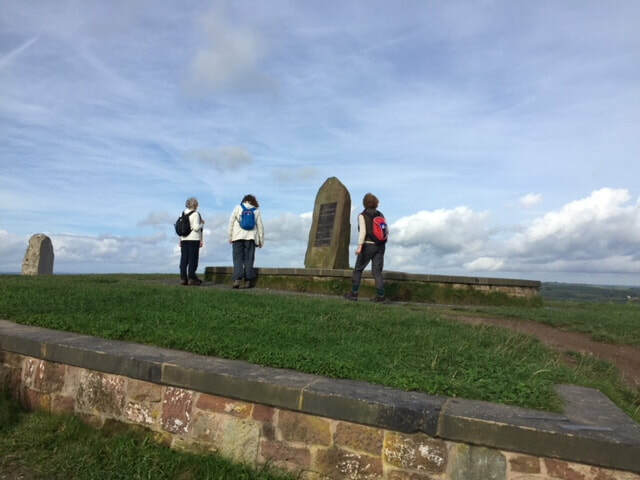 Due to road closures in the Peckforton area, and a rather large bull straddling the footpath on the recce of the second choice of walk, Anne decided to lead a local walk today, up to the top of Pale Heights. In retrospect ,it was a good choice, and it was a walk that most of us know well; probably because of that , we hadn't been up here , as a group, for some time. We started off from the car park at the top of the Yeld, and made our way up to the top of Pale Heights, where we spent some time looking at the standing stones and admiring the beautiful view , despite it being slightly hazy. No matter how many times one goes up to the top, the view never ceased to amaze, and today, with a beautiful blue sky, it was just lovely. There followed a very sociable coffee stop at the visitor centre,where we unexpectedly met the amblers , who had also changed their walking plans. After our coffee, we continued past Eddisbury farm , returning to the carpark via Forest Gate Lane, and despite thinking that the changed walk might be far too short , it was calculated as four miles, all in lovely sunshine, as the following pictures will show. Evelyn was a little concerned today, that the walk would be somewhat boring, as a flat walk was planned, from point A to point B , and back again.She had originally intended to lead a circular walk along the Whitegate Way via Stonyford Cottage Garden, but decided that , at seven miles, it was just a little bit too long .We all breathed a (quiet) sigh of relief, and professed that it certainly would not be boring, as we would all have a good walk, we would all have a good chat, the sun was shining, and we had a coffee in the changed venue of The Lounge to look forward to! 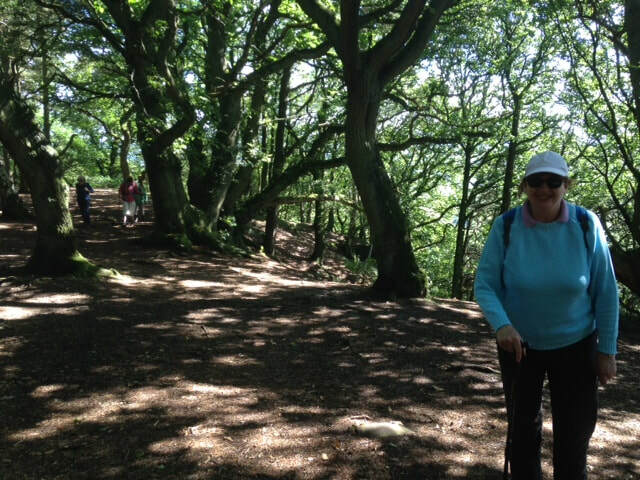 The pictures below show that we did indeed have a lovely walk along the Whitegate Way , making our way through dappled sunshine ,having set off from Whitegate Station. After crossed the A556, we had our coffee at The Lounge (no cake! ), before completing the walk, which was about five miles instead of seven. 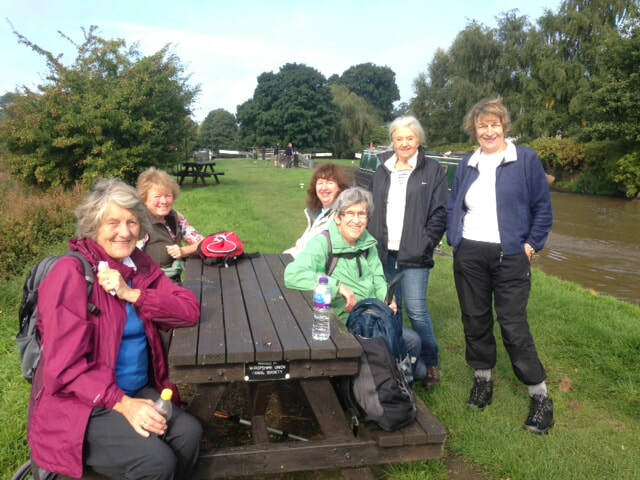 Cathy led today\s walk, around Lymm. Her report is below, followed by a picture of the small select group. On a calm and sunny morning a car load of 4 set off for Lymm. The walk in the woods around the dam pleased us with dappled sunlight, bluebells, wood sorrell and a golden spread of marsh marigolds by the Wishing Bridge. We were entertained by the tree stump carvings and a mother mallard with 10 newly hatched ducklings swimming around her, as well as an entourage of some 15 drakes! From the footpath to St Peter’s Church Oughtrington we could admire the wide vistas to the North and across to the Pennines. Our usual resting point in the churchyard was all a clatter with mowing and strimming so we pressed on down the hill to the path by the Bridgewater Canal. It was dry underfoot for once and made pleasant walking and we soon arrived at Canal Bank in Lymm, commenting on the entertaining names of the narrow boats. We proceeded through the centre of the village to Sextons the Bakers, where we enjoyed coffee and tea cakes, before climbing up through The Dell and traversing the Dam and the woods to the car park. In all a gentle walk of a good 4 miles with delightful spring weather and very pleasant company. 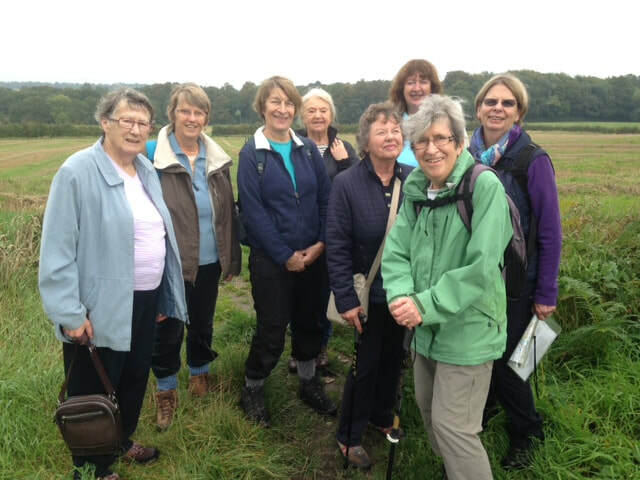 Today's walk was led by Margaret , a 4.5 mile journey around Norley, starting in Hatchmere , next to the Carriers Inn. It was very cold when we started out...... almost at the end of March, and some of us wearing woolly hats and several layers, and Marjorie, who prefers at all times not to be too hot, with bare arms! 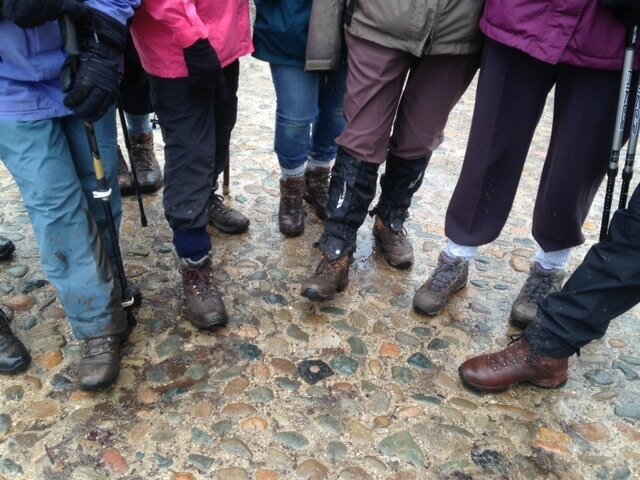 Comments were made about the assortment of footwear we were wearing, despite the dire warnings from Margaret , following her recce , of the possible mud and very wet ground! Jean discovered that she had picked up Peter's boots by mistake, and much was made during the walk of her managing to walk in size 11 boots! 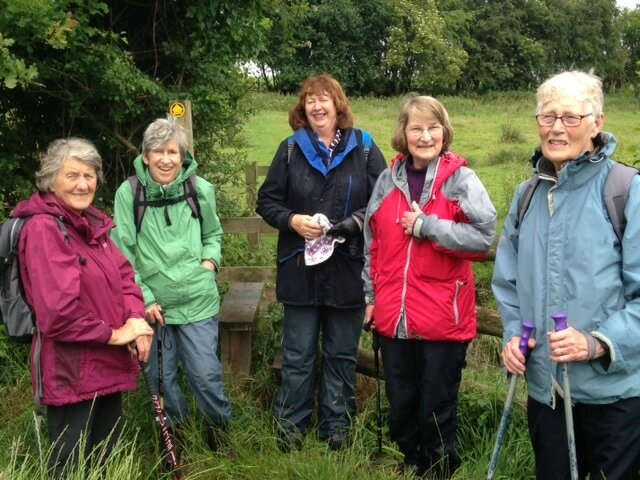 At the end of the walk, Jean burst into peels of laughter when she discovered that she had walked the 4.5 miles , not in size 11 boots, but in Size 13 boots. The walk took us through woods, over fields and past some very beautiful and interesting properties, including an old , beautifully kept farmyard where the old midden used to be, and Norley House, a lovely old property several centuries old. The sun tried to come out on several ocasions, but the woolly hats were not removed! 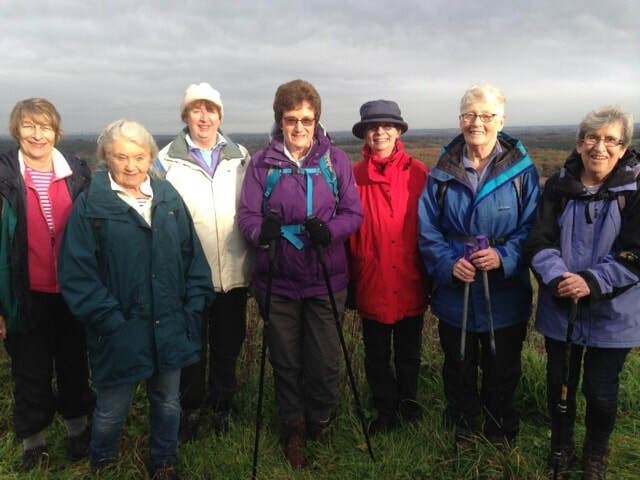 As always, we all thoroughly enjoyed the walk, and Jean did not appear to suffer from wearing a pair of boots several sizes too large . One of the beautiful buildings of Chetham's. 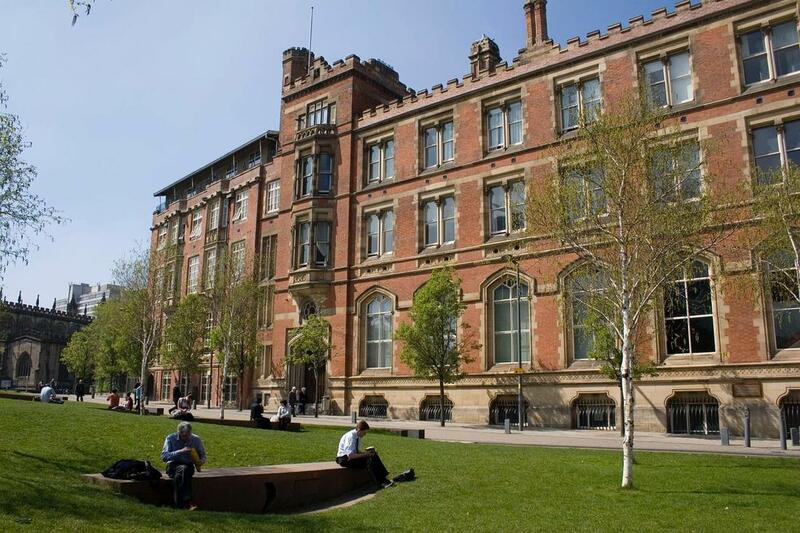 ​Today, instead of our usual walk, Marjorie had organised a very special outing to Chetham's School of Music , in Manchester. Thirty of us, including a few husbands and friends , went up to the city by coach, and had a very enjoyable day. Thank you Marjorie! 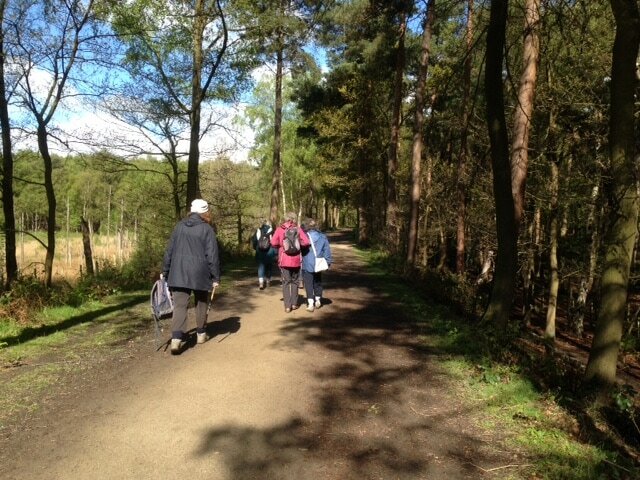 Marjorie's report of the super day follows, together with some pictures taken within the school and grounds. March 7th saw us visiting one of the oldest listed buildings in the Manchester area ,a peaceful oasis amongst the bustling city traffic and high rise developments of the rebuilt central area of Manchester, after the horrific IRA bombing of 1996, the biggest explosion on mainland Britain during that period. Our guide Frances had taught French and History at the school for 17 years and she skilfully guided us around the old buildings which include the wonderful library in which both Karl Marx and Frederick Engels had hatched Das Capital" thus launching the Communist manifesto and all that has led to. The highlight of the visit was a short concert by several of the very talented pupils of the school which was followed by very welcome refreshments. Children attend the school from aged 8 to 18 at a cost of £30,000 per annum.This is frequently subsidised by grants and bursaries from various benefactors and institutions. At present there are 301 students mainly boarders. Prior to our tour members had been free to visit Manchester cathedral ,a stones throw away which had been heavily involved with the building in its various forms over the years. 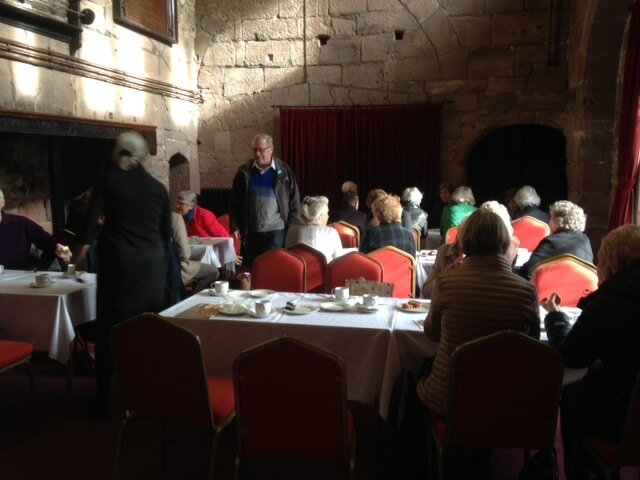 The refectory, where we had our refreshments. 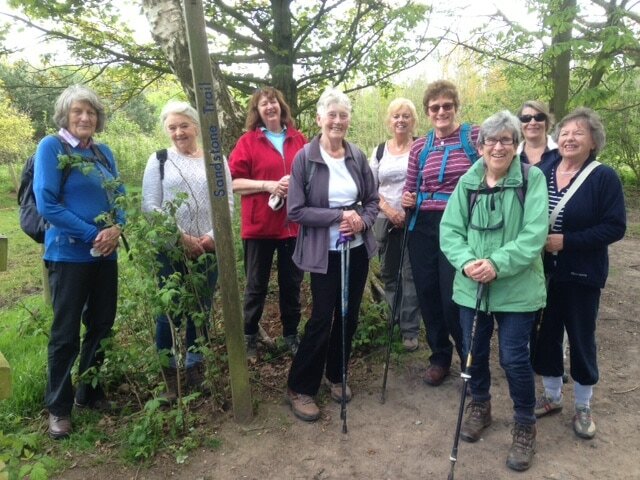 Today's walk was led by Val, and was approximately 4.5 miles, along paths on the outskirts of the Dunham Massey estate. Eleven of us turned up , nine of us planning to do the walk, and two ladies planning to enjoy the guided walk around the gardens, which was due to take about an hour. Having parked in the NT car park, we arranged to meet the garden walkers later, and off we trudged. It didn't take too long for the rain to start ! If we were to choose a phrase which would match this walk perfectly, it would be 'Mud, glorious mud'! 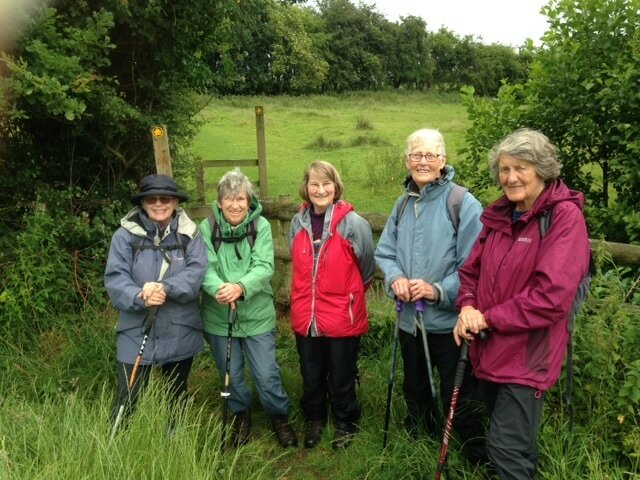 However, with much laughter and good humour, we coped with the quite tricky walking conditions, and enjoyed the walk thoroughly. The first part of the walk was outside Dunham Massey itself, and the second part was along the side of the canal, walking on paths all the way. During the walk, we passed over the River Bolin, which was thundering below us in spate. When we returned to the visitor centre, very damp and muddy, we met Marjorie and Dot , who had been rather disappointed that the garden tour had been cancelled, but they had very much enjoyed their own self-guided tour. 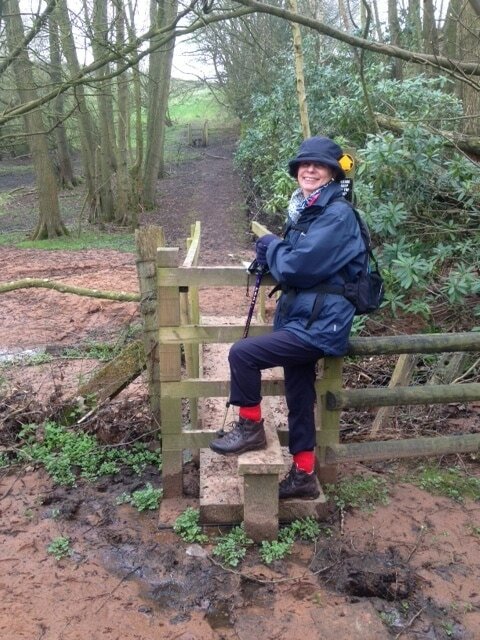 A very enjoyable walk, but Val is hoping that the next time she she takkes us on this walk, the conditions will be slightly improved ! Finally, it has stopped raining! These boots are clean now. You should have seen them before!